Last week I escaped to Lake Garda for a week of sun, reading and relaxation. 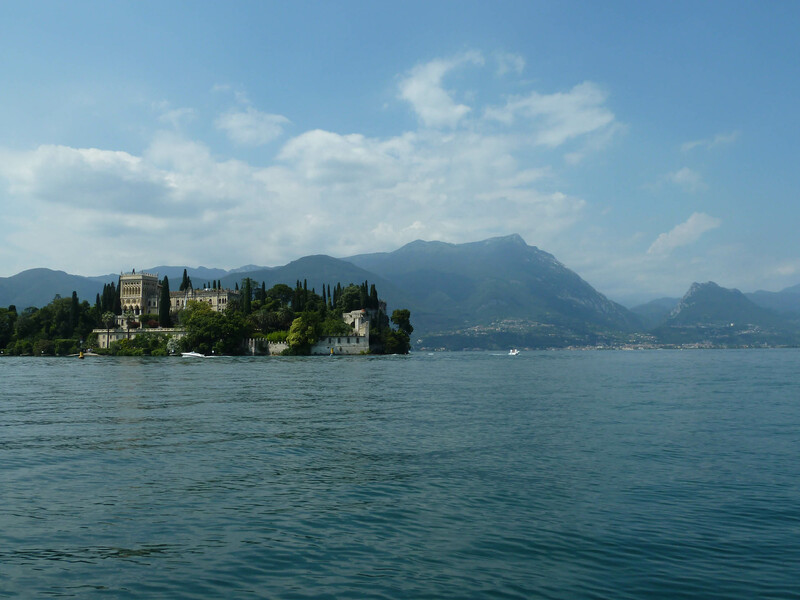 Now, relaxation is rather an alien concept to me so, being in the Northern heart of Italy, I couldn’t resist squeezing in some cultural excursions alongside our fun-filled activities (which included me driving a motorboat and lots of wonderful meals). Out on the lake. Own photograph. 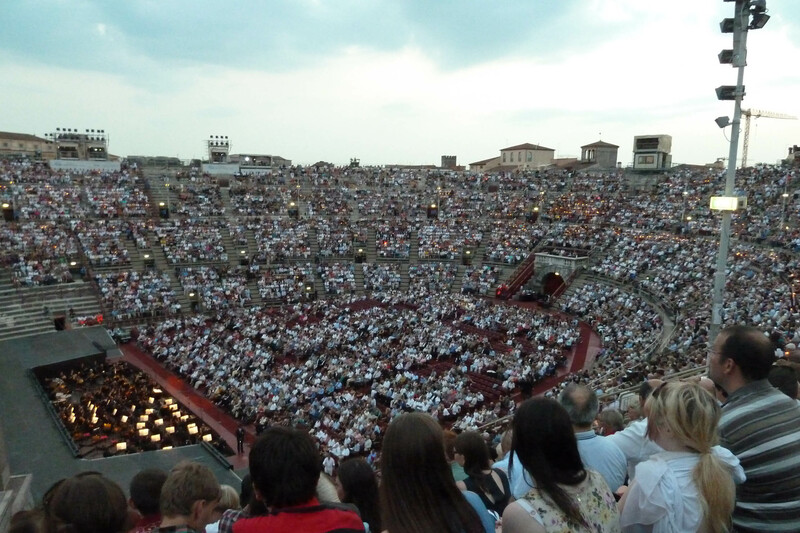 One of the main reasons for the trip was to see Aida at the Verona Arena. The Arena itself is housed in Verona’s Roman amphitheatre; completed around 30AD, it is the third largest in Italy and can seat 25,000 spectators. This is the best preserved amphitheatre in Italy and it is this that helps to create an unrivalled experience and spectacle explaining why so many people (not necessarily opera-lovers) flock to watch the opera during the summer months. Although I’m familiar with Verona, any excuse to wander round the marble paved streets is a welcome one. All there was time for on this visit was a brief walking tour to reacquaint myself with the city. 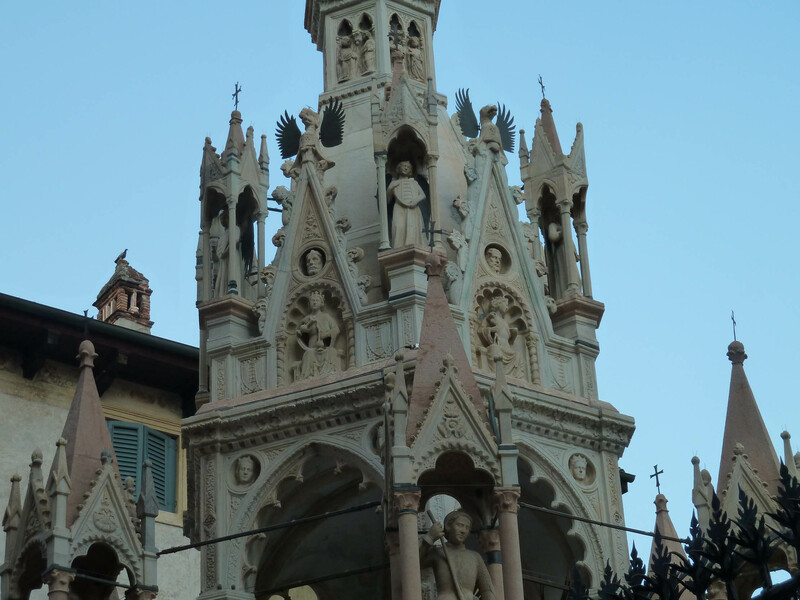 Verona, like most Italian cities, is littered with Roman monuments and examples of stunning Italian architecture. Of course, there’s also La Casa di Giulietta with a romantic balcony that Romeo is thought to have climbed to. It is in fact a 13th century inn that was called Il Cappello which is how it sort of links to the Capulets. This tenuous connection doesn’t stop tourists flocking to the courtyard off Via Capello and graffiti-ing their love messages on the walls. There is also a bronze statue of Juliet and rubbing her left breast is thought to bring good luck in love. Also of particular note are the Scaliger Tombs, a group of five exquisite Gothic monuments in celebration of the Scaliger family who ruled in Verona, found in the courtyard of the church of Santa Maria Antica. The three major tombs show their occupants in dominating equestrian poses and reposing in death below them. Detail of the Scaliger Tombs in Verona. Own photograph. 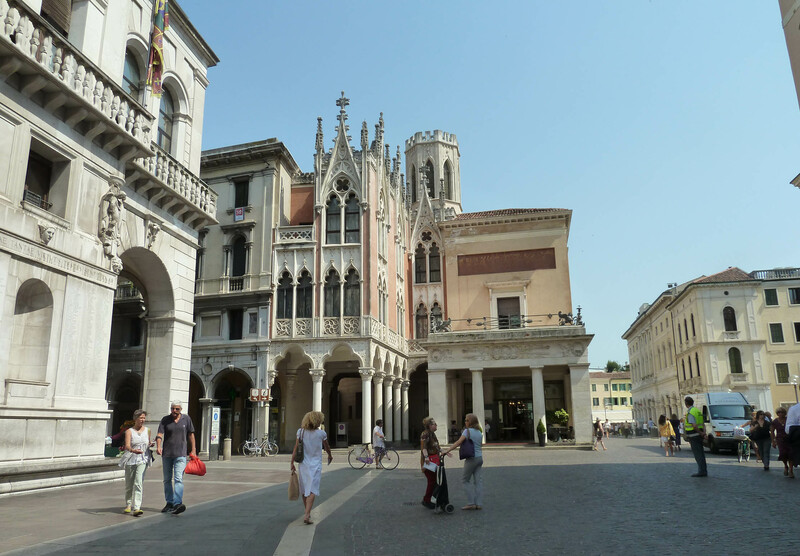 After a 2.30am finish (Aida is a long opera, made even lengthier by numerous intervals and curtain calls), I was up bright and early, in the scorching heat, to take a coach to Padova (Padua). 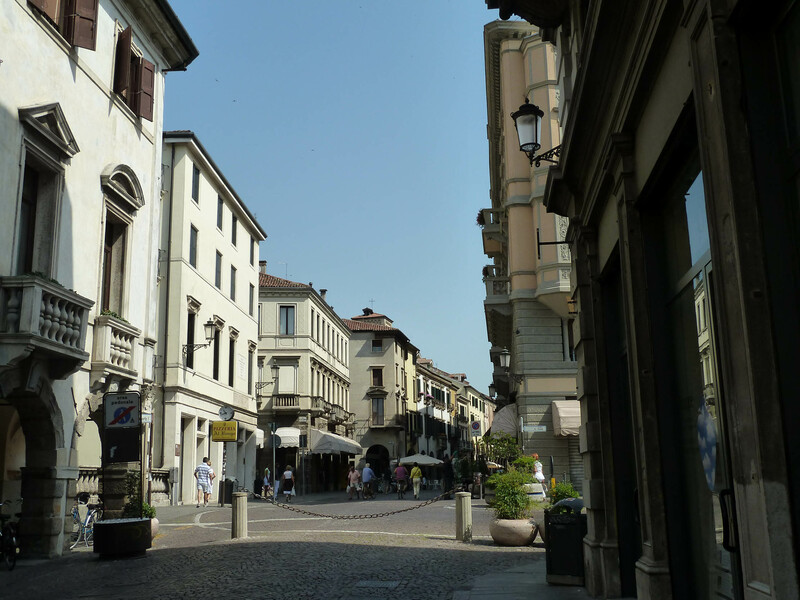 This was my first trip to Padua and we began on a guided walking tour of the city admiring the palazzos that appear on nearly every street. With only a few hours and being forced to work around the lunchtime closures, I had to be selective with what interiors I saw. 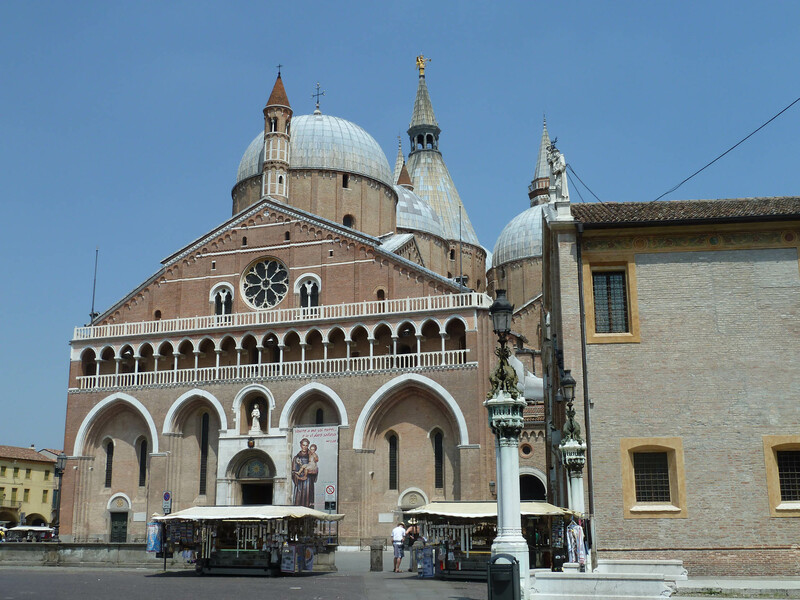 Padua is known for its university; founded in 1222 it is one of the earliest in the world. I was lucky enough to be walking past on graduation day which is certainly a bit more frisky than any UK equivalent. After formal photographs with a laurel wreath, giant posters are pinned up in the piazza. They are made by the graduates’ friends and each poster shows a large caricature of the student in question and a multitude of stories about their time at the university. They are taped to the university wall for all to see and read out by the graduating students in costume in the square. And, there’s a local anthem to accompany this madness, “Dottore, dottore, dottore del buso del cul. Vaffancul, vaffancul.” I’ll let you translate that of your own accord if you’re interested but it’s very catchy and rather rude. Caffè Pedrocchi in Padua. Own photograph. The lewd songs started to give me the true feel of the city – vibrant, noisy and energetic. Just across the piazza is Caffè Pedrocchi, built in 1831 and famous for never being able to close as it had no doors – glass doors are now incorporated into the design. It is still a hub of intellectual and social discussion with very refreshing and special mint coffees. The first floor also contains a museum that recounts local and national history. 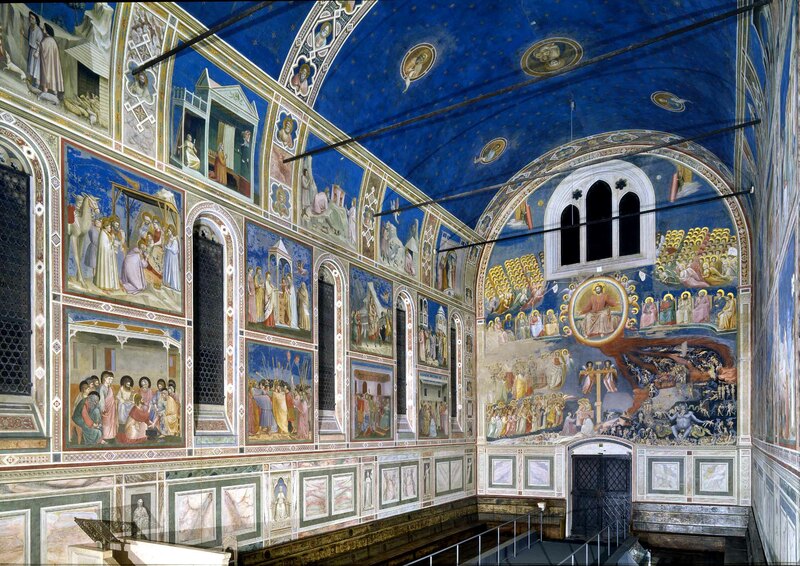 Padua is famous for its Giotto frescoes in the Scrovegni Chapel. As our guide told us that visits to the chapel had to be pre-booked months in advance my heart sank. I couldn’t come all the way to Padua and miss it so I decided to try my chances and, after much debating with the ticket desk in a mixture of Italian and English, they let me in. The Scrovegni Chapel. Image via www.padovacultura.padovanet.it. The works are so delicate, that in order to protect the frescoes, there is a state of the art entrance system that controls a microclimate inside the chapel itself. True to form, the Italians were running late with their supposedly regimented entry system but, finally, I went into the pre-room where we were shown a video – firstly a marketing tool about their other museums and then a look at the history of the chapel. Considered to be the medieval equivalent of the Sistine Chapel, the building is a magnificent funeral chapel with a barrel vaulted ceiling showing a starry sky. Divided into two, the back held the public while a smaller section at front was exclusively for the Scrovegni family. A small door on north wall connected to the Palace, to avoid them having to mingle with the commoners. 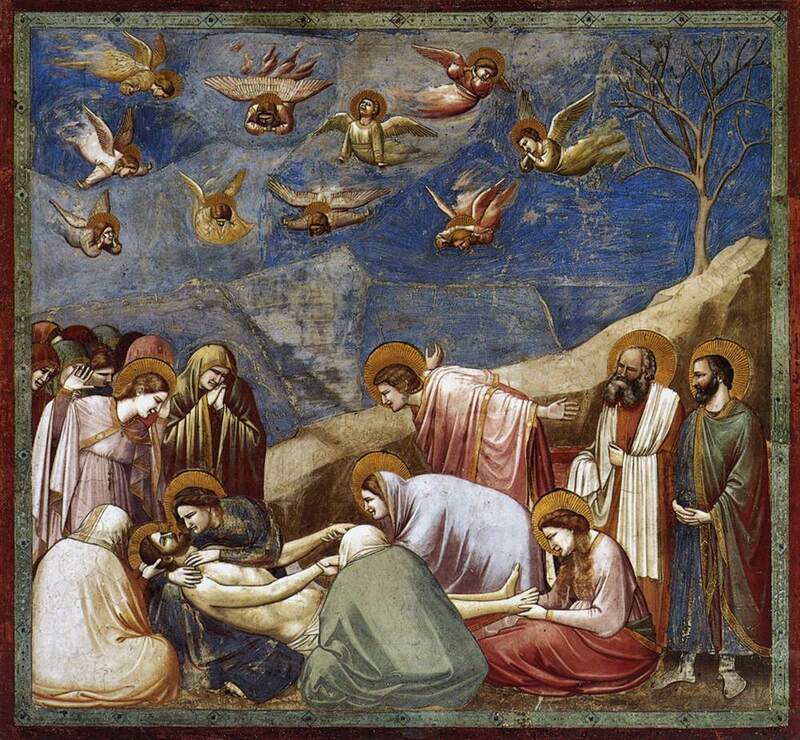 While Giotto was responsible for all the paintings, Pisano was commissioned to execute the three altar pieces. This is the most complete cycle of Giotto frescoes remaining, looking at the lives of Joachim and Anna, episodes from the Virgin Mary’s life and episodes from Christ’s life and death. The lower walls depict allegories of the vices and virtues. A detail of the Scrovegni Chapel. Image via www.walksofitaly.com. The architecture is thought to have been designed around the scheme for the painted fresco cycle. The chamber is completely covered in paintings and there is no doubt that this is impressive but I had expected to be more overwhelmed, more in awe. The colours would have been brighter and more intoxicating in their day but, for me, the chapel lacked something. 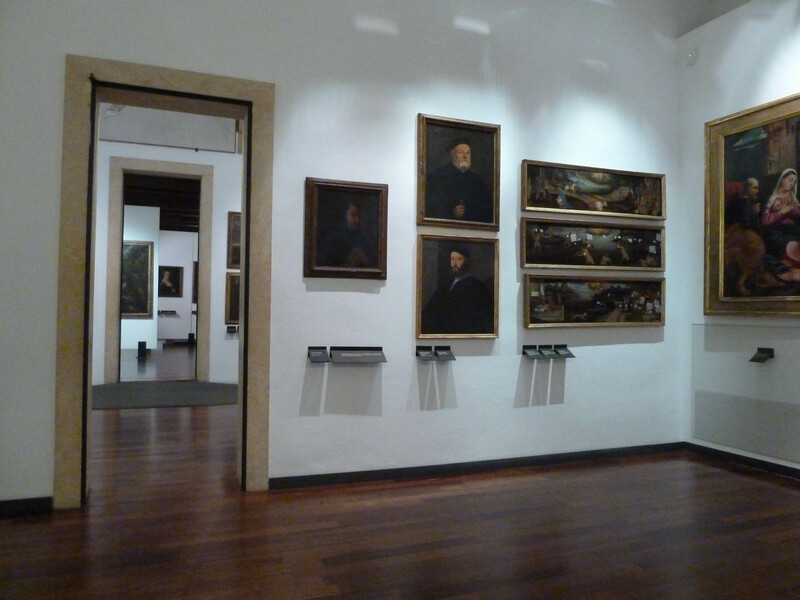 Although I was short of time I had a speedy scoot around the Museo Civico in the same complex. This is an absolute goldmine and I was taken aback by the sheer range of their collections. Scurrying over the cobbles, I headed to the Baptistery at the Duomo which houses a fresco cycle by Giusto de’Menabuoi – sadly the Duomo itself was shut for a long lunch. The pictorial cycle here shows The Paradise, The Creation, The Crucifixion and the Descent of the Holy Ghost. These frescoes have been relatively recently restored, emphasising and bringing out the natural colours and revealing the full wonder of the layout and iconography. This imagery is so overwhelming that it is exhausting – in a good way. For me, this building had the effect I had hoped for at the Giotto chapel. With over 100 scenes you just don’t know where to look first. 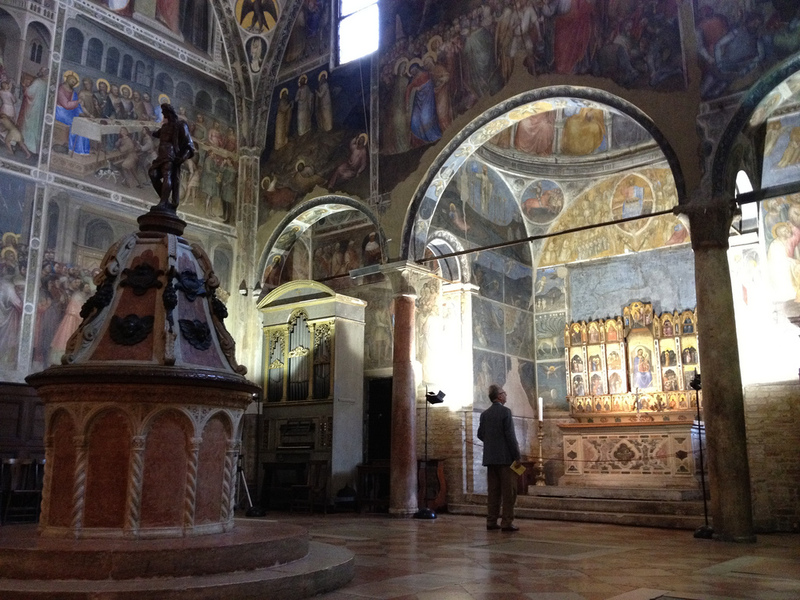 Frescoes at the Baptistery. Image via http://therealchrisparkle.wordpress.com. I stopped in one of the main squares at an all-Italian (always a good sign) scruffy looking bar that served mainly sandwiches and spritzes – lunch was divine and gave me the boost I needed to get back up in the 40 degree heat and continue my whirlwind tour. Prato della Valle. Own photograph. 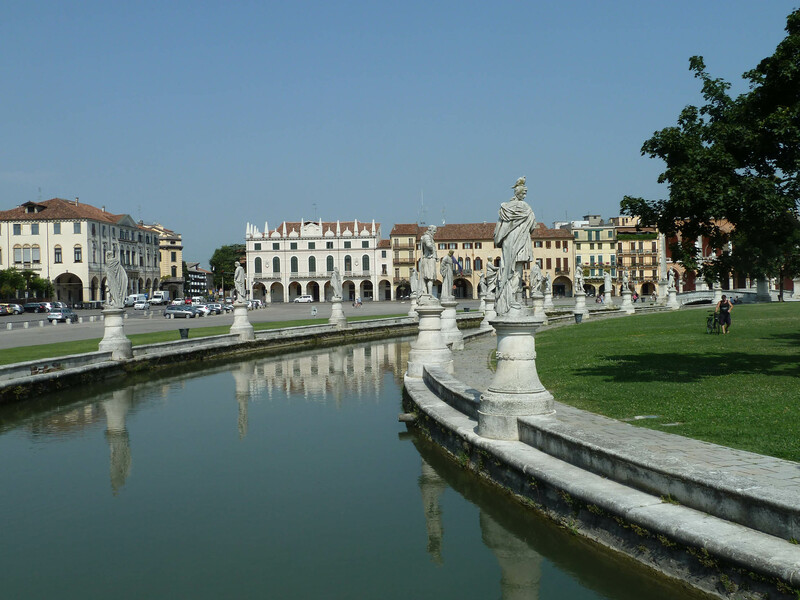 Next, I wandered through the largest and most impressive piazza in Padua, the Prato della Valle; surrounded by a moat it houses 79 statues of those associated with Padua’s prosperity. Down one of the side streets is the Basilica Sant’Antonio, a building designed to house the Saint’s remains. The Italians, as ever, have gone all out with a cluster of seven domes, a beautiful cupola, two campanili and two smaller minarets. The treasury holds the tongue and larynx of Il Santo and queues form to see this – I have to say the architecture and Donatello’s altarpiece appealed more than someone’s old tongue. It was time to sprint back to the coach although I wouldn’t have minded being left in Padua. It’s a town that hasn’t yet been overrun by tourists and still has an amazing truth to it. We headed back to the lake via a tour and tasting at a Soave vineyard. The dessert wine was divine and my trick of wrapping it in towels and packing two bottles in my case worked fine. It wasn’t even overweight – I knew I should have got another bottle. But now I’ve got an excuse to head back soon to stock up. I’d better book some more opera tickets and flights! 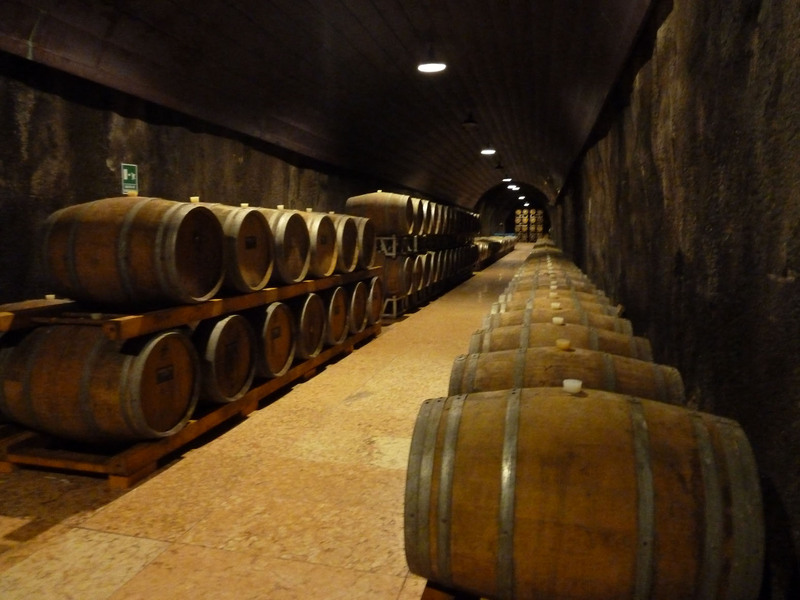 La Cantina di Soave. Own photograph.